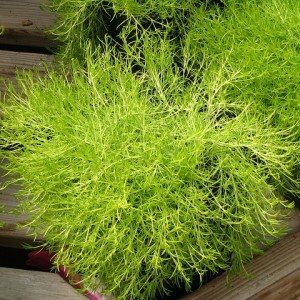 Sagina (the Irish moss) is an evergreen perennial plant from the family of Caryophylláceae. This type of a sagina is the most widespread in Europe, and all in the world about 50 species of this ground cover plant are. Sagina is known since the XIX century, this plant already then called a moss because of appearance. Actually, sagina can be describes as something between a moss and a grass, such, some kind of, transitional look. Sagina forms green pillows which height reaches 8 cm. Sagina perfectly grows both on the sun, and in a penumbra. More often this plant can be met on well lit places – the Rocky Mountains and sandy plains. The plant has branchy creeping stalks, easily taking roots escapes, small needle leaflets and tiny snow-white flowers, with a diameter no more than 0,5 cm. Thanks to that escapes well take roots, sagina expands incredibly quickly and forms a dense carpet. And if on this carpet often to go, it will be even more dense.